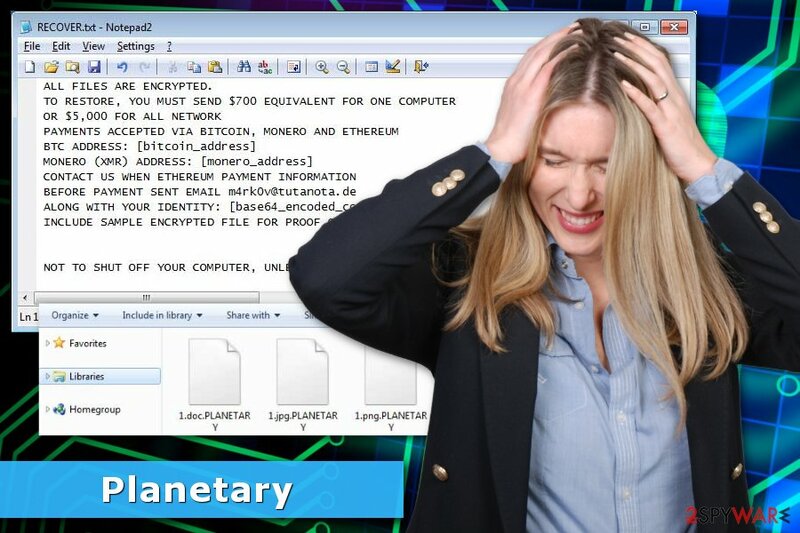 PLANETARY ransomware is the cryptovirus that released a few new versions at the beginning of 2019. This is a serious cyber threat that needs to be terminated with professional anti-malware programs. Get a reputable tool and scan the system fully to clear all malware. Planetary ransomware is the cryptovirus that uses AES method to lock users' files. Planetary ransomware is a file locker that was first spotted in December 2018. Initially, malware was named Mercury ransomware due to its extension, and no name was present on the ransom note or anywhere else. However, security researchers quickly realized that a cryptovirus that appends .mercury, .pluto, and .neptupe comes from the same string, and later extensions like .yum and .mira were added, stopping the space object-themed names. Planetary is a standalone cryptovirus that does not belong to any other known ransomware family. After the infection, malware targets personal files and encrypts them with AES-256 cipher, preventing victims from using them. It then drops a ransom note !!! READ_IT !! !.txt, which explains to users that, if they want to retrieve the access to data, they need to email hackers via getmydata@india.com, mydataback@aol.com, recovermydata@protonmail.com, and others. However, there is no need to pay hackers as two decryptors are already available – they should help users to recover data for free after Planetary ransomware removal. Another virus – HC7, uses .PLANETARY file extension, but is not connected to the threat we are describing in this article. Developers of Planetary ransomware virus have mostly been spreading this virus via spam that relies on misleading subjects, such as “invoice,” “business report” and others. 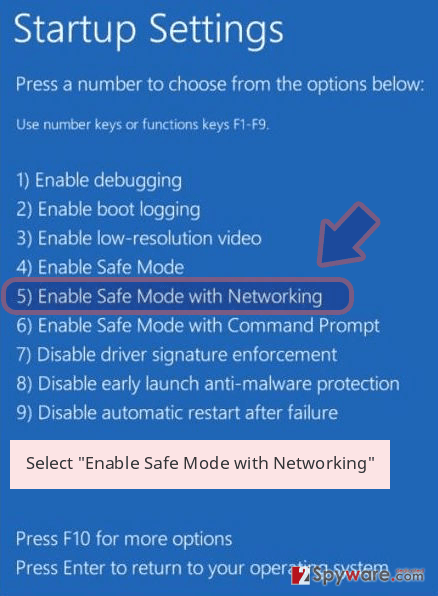 Once inside the system, this nasty virus infects all remaining PCs connected to the same network. Once infiltrated, this malware encrypts your files that can include videos, photos, documents, and similar data. Then, it adds the predetermined file extension at the end of every file name. For example, a video file called “video.mpg” would be renamed to “video.mpg.PLANETARY”, so there is no way to miss the fact that you are infected with ransomware. From this point of time, all your files with this extension at the end become completely unusable. 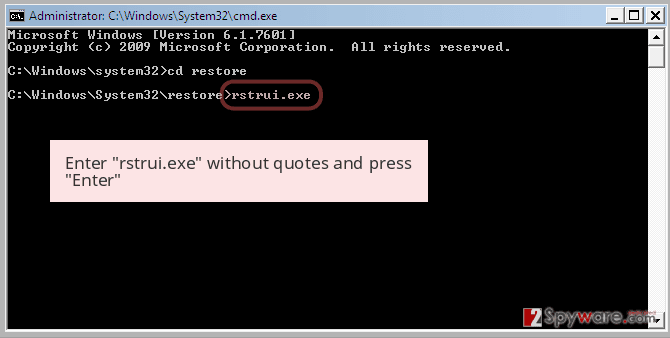 Additionally, this virus places a text file called “RECOVER.TXT” on the desktop and every folder which was infected. This text file explains what happened to your data and how can you recover it. Keep in mind that developers of this malicious threat have the only goal – to acquire users’ money. If you have just become the victim of this ransomware virus, make sure that you keep yourself from buying decryption key from its developers and take care of Planetary ransomware removal. The ransom note also claims that the user has 48 or 96 hours to pay the ransom before all encrypted files are deleted from the computer. As we have already mentioned, ransom asked by PLANETARY varies between $500 and $5000, depending on the number of devices affected. The new fact is that the payment can be paid in different cryptocurrencies, including Bitcoin, Monero, and Ethereum. We highly recommend you to remove PLANETARY ransomware fist and only then start looking for ways to recover your files. For that, you can use Reimage or other reliable security software. Keep in mind that there is always a chance that you won’t receive the required code for the decryption of your files because people you are dealing with are hackers. 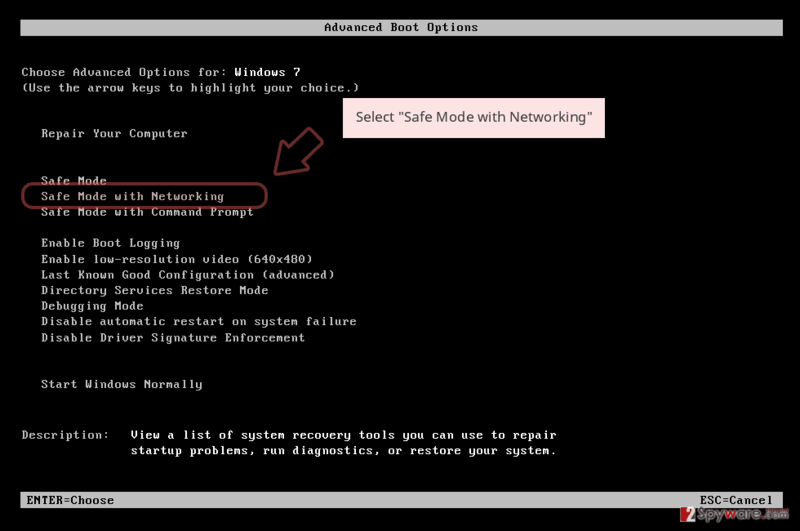 Changes in your DNS and system settings. To sum up, you should remember that the amount of ransomware viruses that can infect you is enormous. All of them have an identical function – encrypt victims' files and make them pay the required ransom. There are only two differences among them – the amount of ransom that is demanded and the encryption algorithm used by viruses to make files unreadable. However, as evident, you can use Emsisoft's or F-Secure's decryptors to retrieve your files for free. Mercury ransomware is the first version with a changed ransom note file – !!! READ_IT !! !.txt from RECOVERY.txt. Virus employs the same AES encryption method as the first variant and appends data using .Mercury file extension that fits with the Planetary virus theme. In the ransom note, as usual, virus developers state their contact information – getmydata@india.com and mydataback@aol.com email addresses and informs what is next for the victim. 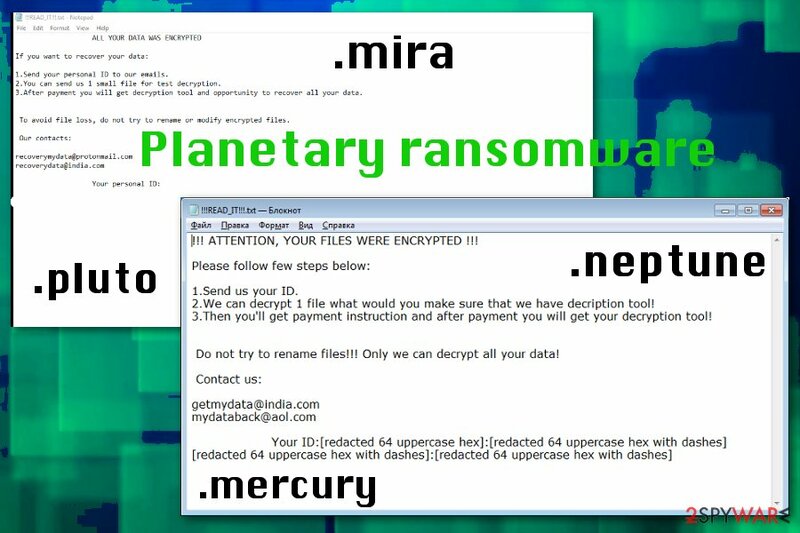 Pluto ransomware appeared almost at the same time as Mercury ransomware, and these two versions also share the same ransom note, contact emails. It is possible that this is the same version that uses two different file markers because .pluto gets added to files after the sophisticated encryption process. March 2019 came in strong when new versions of Planetary ransomware emerged. .neptune and similarly as the previous two came with the expansion of .yum file marker at the same time. Developers haven't changed the ransom note for these two either. Users data becomes locked and !!! READ_IT !!! .txt gets added to every folder with encoded files. Email addresses for these versions – recoverymydata@protonmail.com; recoverydata@india.com. In the same March of 2019, Mira ransomware came out. However, this time with only one .mira file marker. The same AES encryption algorithm as all the previous versions get employed in the file-locking process of this version. However, affected files can get decrypted because F-Secure reported about the Mira decryption tool. Planetary ransomware is the virus that came back in 2019 with new variants. Spam emails. In most of the cases, ransomware arrives as a useful email message, having an important email attachment. Typically, the subject of such email says “Your important delivery,” “An invoice,” etc. Please, do NOT fall for such email because the attachment that looks useful can lead you to the infiltration of this malware. Malicious websites. Hackers can easily set up a fake website that can be used to spread ransomware. Typically, they encourage users to click and download fake updates, promo codes, supposedly missing programs, etc. Redirects. Redirects can lead you to dubious websites where ransomware can be downloaded and installed. 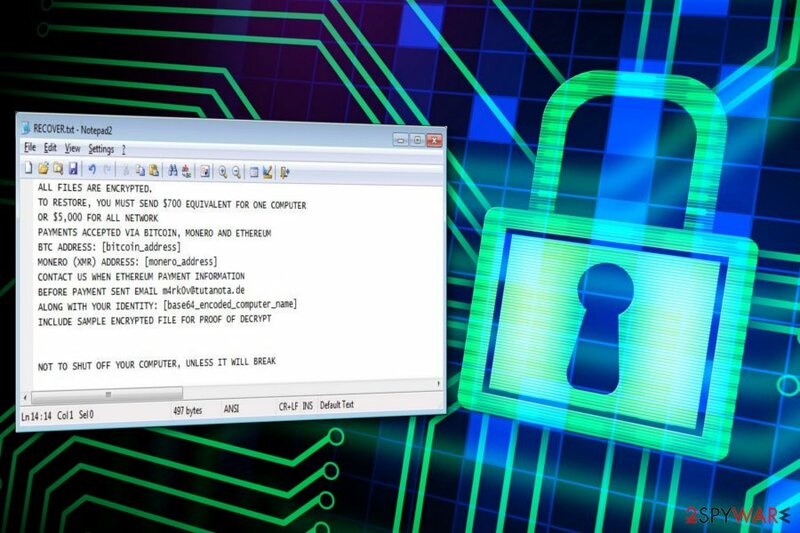 Evidently, ransomware can get into your machine relatively easy. Therefore, being cautious at all times while browsing the internet is extremely important. The security team from Bedynet.ru also suggest to create data backups and update them regularly. The first step to recover your computer to its previous state is PLANETARY ransomware removal from your machine. For that, make sure you run a full system scan with Reimage, Malwarebytes MalwarebytesCombo Cleaner, or Plumbytes Anti-MalwareMalwarebytes Malwarebytes. Keep in mind that a virus can block the scanner while trying to protect itself from removal. In this case, you can use one of the guides explaining how can you unblock the program and have this ransomware terminated for you. Only then you can proceed to file recovery. This procedure should be initiated only after you remove Planetary ransomware from the system. The best solution is to use your file backup to restore affected data. Therefore, make sure you back up your files externally and update them as required. The more recent versions can be decrypted. Mira ransomware that came out in April 2019 has the decryption tool, you can find here. Previous versions can now also be decrypted using Emsisoft's decryption tool listed below. 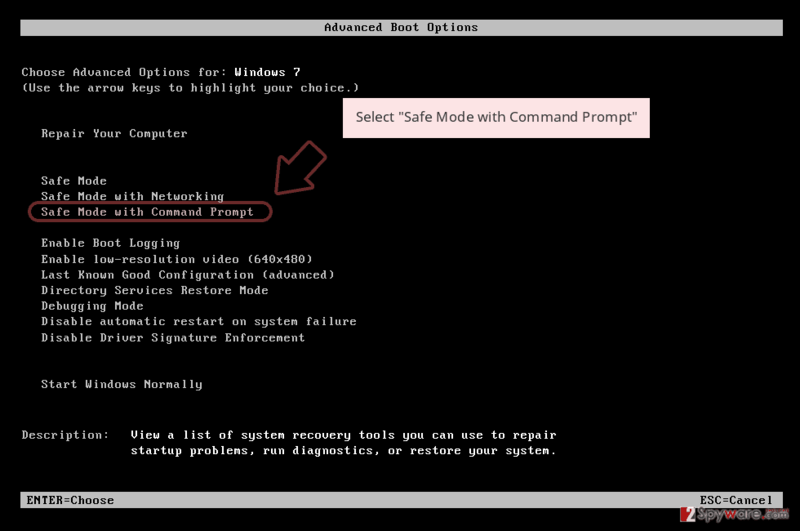 To unblock anti-virus and remove ransomware from Windows, try rebooting your computer to Safe Mode with Networking. Log in to your infected account and start the browser. Download Reimage or other legitimate anti-spyware program. Update it before a full system scan and remove malicious files that belong to your ransomware and complete PLANETARY removal. When a new window shows up, click Next and select your restore point that is prior the infiltration of PLANETARY. After doing that, click Next. 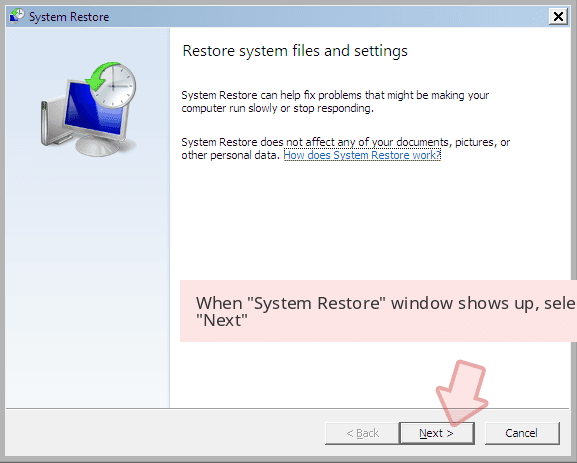 Once you restore your system to a previous date, download and scan your computer with Reimage and make sure that PLANETARY removal is performed successfully. Guide which is presented above is supposed to help you remove PLANETARY from your computer. To recover your encrypted files, we recommend using a detailed guide prepared by 2-spyware.com security experts. 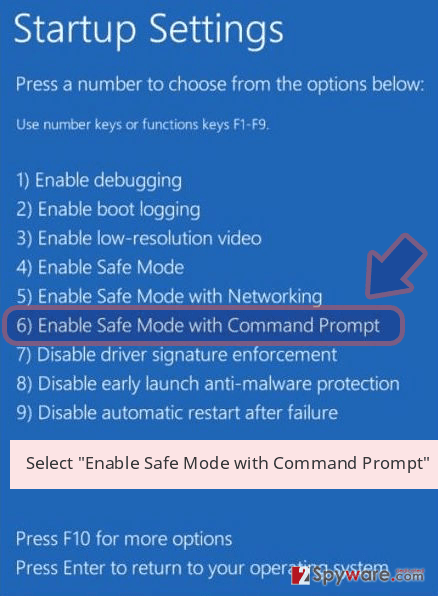 To recover individual files, follow the steps below. 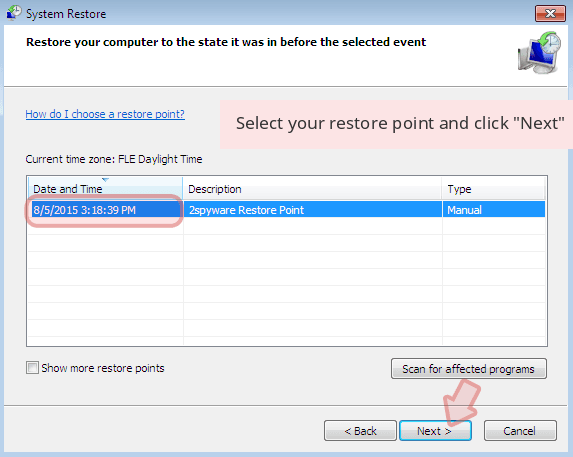 However, System Restore had to be enabled before a ransomware attack. 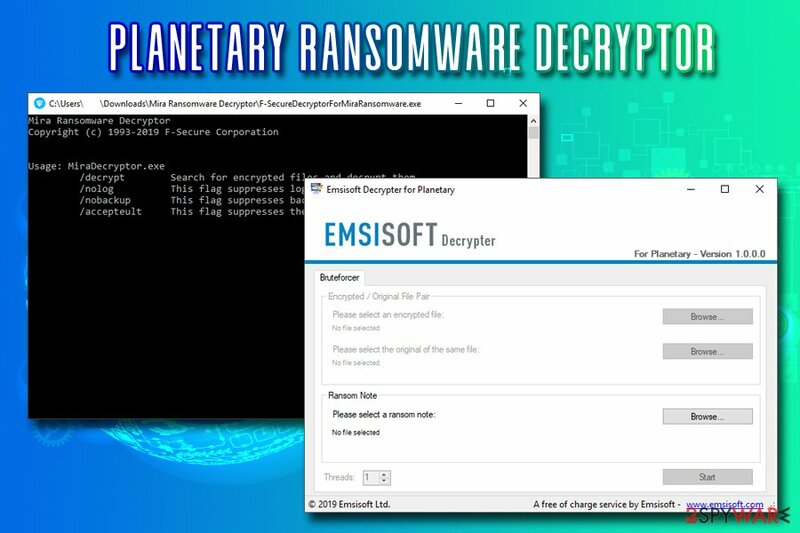 You can recover your files for free by using Emsisoft's decryptor – it shoudl work for all Planetary ransomware versions. Additionally, you cal also take advantage of F-Secure's decryptor that only applies to .mira variant. ^ Mira ransomware decryptor. F-secure. Cyber security solutions. ^ AV detection rate . 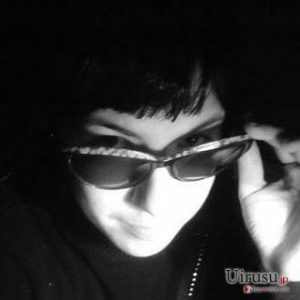 Virustotal. Spyware related news. ^ What is Cryptocurrency: Everything You Must Need To Know!. BlockGeeks. Blockchain Training, Education and Courses. ^ Danny Palmer. 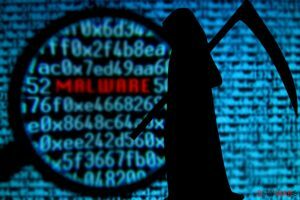 RAA ransomware now targets businesses, installs data stealing 'Pony' malware. ZDNet. Technology news, analysis, comments and product reviews. This entry was posted on 2019-04-08 at 10:14 and is filed under Ransomware, Viruses. You can quickly scan the QR code with your mobile device and have PLANETARY ransomware manual removal instructions right in your pocket. How did you remove PLANETARY virus?